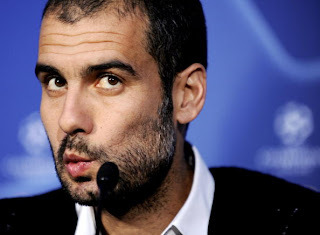 Barca boss Pep Guardiola has been cleared of all charges of druggy behavior. Hmm. An Italian tribunal was involved. Well if an anti-doping court in Italy says so, then it must be true. Considering that he was banned from two leagues for testing positive twice, I'd say his legacy would be concerned too if even his playing career was tarnished by steroids. I know I've been away for a while, but I found this "emerald" gem. (Oh behave). But I've got a goal not from the this week's busy EPL, Serie A, or even Champions League upsets. This week goes to those Ammurricans. Go ahead and jump to 0:23 for the hook, line, and sinker. Fredy Montero of the Seattle Sounders blasts it from long range with a dollop of top spin to ping it off the crossbar. That I like. In the back of the net, far corner. What a cheeky little guy. Let's hope he stays healthy and can keep arguing with the officials like that for the rest of this season. I reached back a bit when I saw this one. Oh lawd. I do have a sweet spot for those great long cannon strikes. No shenanigans, they've set phasers to kill. That's right. If you were planning on bringing flares, smoke bombs, or Millwall bricks to Johannesburg, you might want to repack your matchday satchel. The new national police commissioner in the world's deadliest and most criminal country (50 murders a day) has revealed that he plans to meet any and all shenanigans with some serious brute force. South Africa will be the world's stage next summer, so it's no surprise that deputy security minister, Susan Shabangu, also supports the stronger arm of the law. "I will not tolerate pathetic excuses"
"Aiming her words at police chiefs, she said of criminals: "You must kill the bastards if they threaten you or the community. You must not worry about the regulations - that is my responsibility. Your responsibility is to serve and protect. "I want no warning shots. You have one shot and it must be a kill shot. 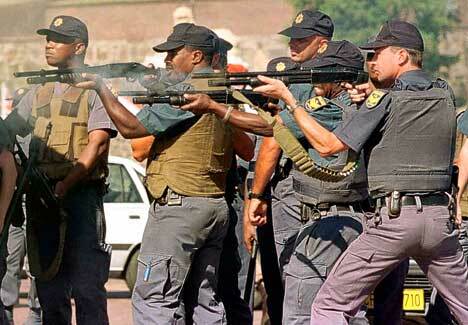 It has brought up fears among some that it may bring back apartheid style policing, with the notoriously trigger happy law enforcers of the 50's and 60's. If you still plan on witnessing the World Cup in person, just be sure to be on your best behavior, and try to stay away from the cops and robbers. Alright, we've got every goal from the first Champions League matchday of the season. Dig in. Strong outings for the big spending clubs, with no real surprises or upsets. One some what odd scoreline was Barca-Inter, as it seemed Ibra and Etoo didn't seem like they wanted to score on their old teams. Or maybe that was Mourinho's weird way of saying, "I want Pep's job". So what message was this about? The two match European ban on Eduardo has been lifted by the UEFA appeals committee. In other news, UEFA continues to be operated and run by mood-swinging and PMS-ing little girls. This was such an opportunity to finally put a foot down on the biggest villain in all of organized sports, worse than oily Arabs and Russian blood money, illegal touching, er, tapping of children, and far more worse than Posh Spice: diving. We all know it exists, much like the basic vices and sins I just listed, it is a part of the fabric of how the game is played. And unlike Arabs and Americans buying clubs as presents for their children, the act of diving and the cheats that dive are the single things we all wish would disappear from the game for good. But then Real Madrid would have no roster. And nothing of value was lost. I can measure this man's charm and character with one hand. After the game, he told reporters that he was sorry for stamping on Van Persie's face and his goal celebration in front of the Arsenal supporters, who he loves to pick and prod at. "I just got caught up in everything. I want to say sorry for what I did, it is important for people to understand that. "I am so happy to score for City, I have scored in every Premier League game and I'm proud of my record." Gunners' manager Wenger, though, was far from forgiving after the match. He said: "I can't assess Adebayor's performance and I haven't seen the incident with Van Persie. I am back from my unannounced leave. Apologies to everybody, but I did not realize that at my past location that Youtube, Twitter, Blogger, Facebook, etc would be blocked. For the past two and half weeks I was halfway around the world in China, for a short vacation of sightseeing and visiting family. My dad is currently working and living in Beijing, so he got our family to go for a wonderful sightseeing visit. Beijing is incredible, as the entire city is one giant shimmering metropolis. I also went to Hufei, Qingdao, and Shanghai. If any of you get the chance, I wholeheartedly recommend visiting China, despite whatever difficulties. It truly is an incredible country. So, while I was in China, I was unable to blog! Any websites that are content related are blocked by the Chinese government, even if it's a small footy blog. But, I was however able to follow the world of football with sporadic internet connectivity. Two and half weeks is a monster amount of time in the world of sport, especially football. I watched many matches, followed transfer deadlines, and caught up on gossip while I was away, but now I must get up to speed and keep up my writing. But not before I reveal this little gem. Taxi cabs in China have always been just as numerous as bicycles, and they used to be run down and beat up pootermobiles. These days, however, taxi cabs in Shanghai have stepped it up a notch with in-car interactive entertainment for the taxi riders. Guess what I saw while I was in one of these taxis. Yup, that is Jose Mourinho's smug mug on the back of a taxi headrest in Shanghai, China.